Publication Information: Xlibris Corporation. 2010. 553 pages. Book Source: I read this book as the monthly selection for my local book club. The book was a Kindle purchase through Amazon. Favorite Quote: "Hot chocolate. Only Mom would think hot chocolate could save the world and tilt the balance of good and evil. If she could, she would hand out cups of hot chocolate and freshly made cookies to soldiers entering battle and feel certain it would shield them from harm. As an adult, I loved her for it. As a kid, I wanted to scream for some focus. There were times I did not want Dorothy on my side; I wanted the Witch." 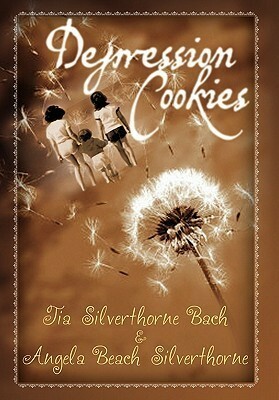 Depression Cookies is a look at the story of a family from two parallel perspectives. Abby is a wife attempting to support her husband's career dreams, a mother trying to steer her daughters safely through childhood and the teen years, and a daughter dealing with aging parents. Krista is the oldest of Abby's three daughters - a teenager who trying to navigate that tough age. Because of Bob's career aspirations, the family finds itself moving from town to town every couple of years. Bob pursues his dreams, and his family is left to deal with the ramifications of starting over time after time after time. I related to and sympathized with the plight of these women. What a challenge to have to move to a new community every couple of years and to have to start over. I had to do that once in my life, and it was a very challenging experience. I can't imagine having to do it over and over again. It was interesting to read both Abby's and Krista's perspectives, coming from such different points in life. As a woman and a mother, I related to their experiences and relationships. However, unfortunately, the book was long - close to 600 pages, and after a while, it started to take on the tone of a journal vent. That is a coping mechanism many people use. A journal where you vent out whatever you are feeling at that particular moment - the good, the bad, the whiny, the angry, the sad. It is a very useful tool for processing emotions and getting through difficult times. The process in and off itself is cathartic and part of letting go of those negative feelings. However, that journal is not meant to have an audience. This book seemed to build and build upon those feelings, and I felt as if I was the audience to that. So, much as I could relate to this family of women and the situations they found themselves in, I found myself not really wanting to read about it. Thanks so much for taking the time to read our book. Thank you for visiting and reading the review. Our book club had a fascinating evening discussing your book. Different opinions, different thoughts making for a great discussion.